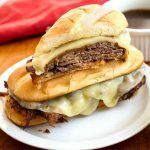 Instant Pot French Dip Sandwiches are one of those meals that seems difficult to make, but they really aren’t. 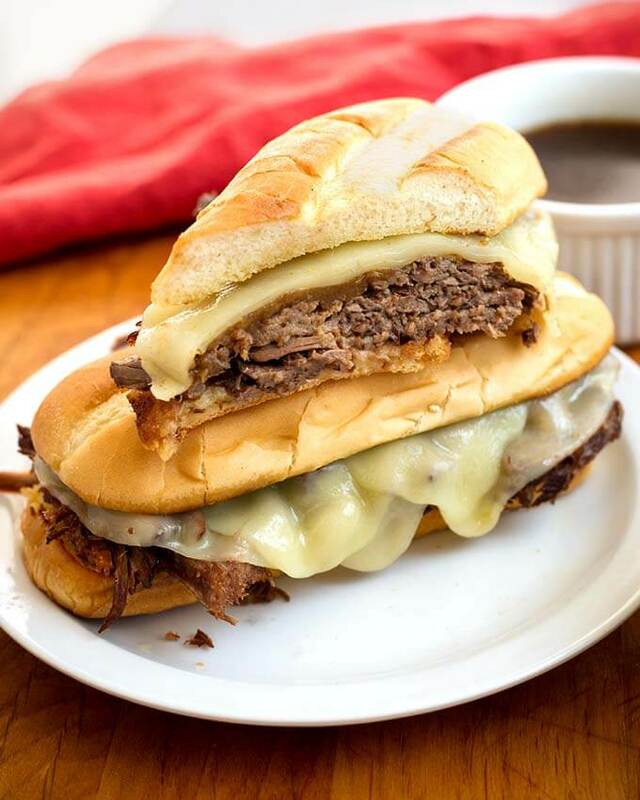 Tender slices of beef on a hoagie roll, topped with gooey melted provolone cheese. Then dunked into a flavorful au jus, which is made at the same time as the roast. 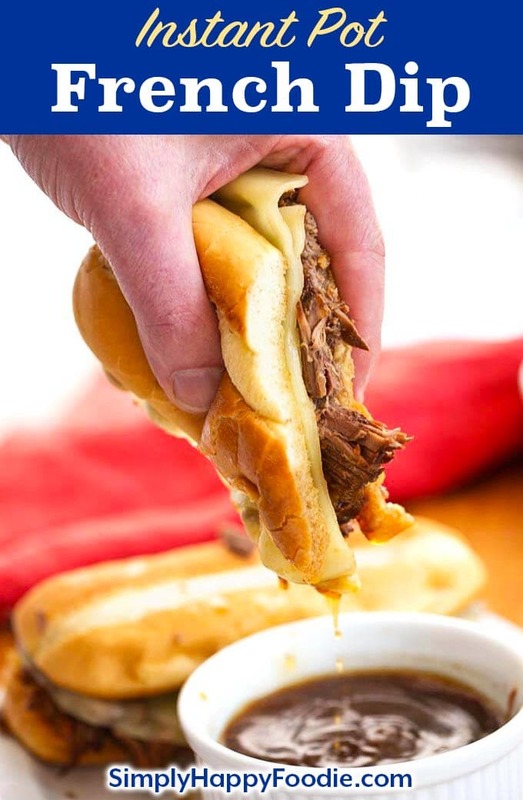 My Pressure cooker French Dip sandwiches recipe is a family friendly meal! When I was growing up there was a restaurant called Frosty’s that we went to often. Oh boy, they had amazing meatloaf, the coldest and frothiest root beer, and best of all, they had the most amazing French Dip sandwiches ever! I was little, but I could eat a whole one! Lol! That was the first place I had ever eaten one. Sadly, Frosty’s is gone, but the memory of their French Dips will remain with me forever. Sigh. 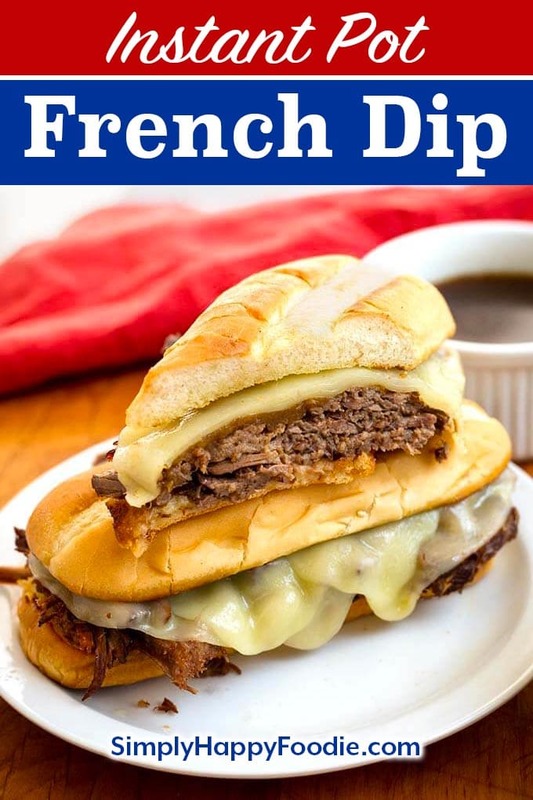 I had to come up with my own version of the French Dip Sandwich, because even though Frosty’s was no more, I have to have one once in a while. So I have adapted my recipe to make in the Instant Pot. Cooking a beef roast in the pressure cooker takes about half the time as braising in a dutch oven. Broiling the sandwich once you get the cheese on it is optional. If you keep the meat covered and warm, it may melt the cheese just fine. 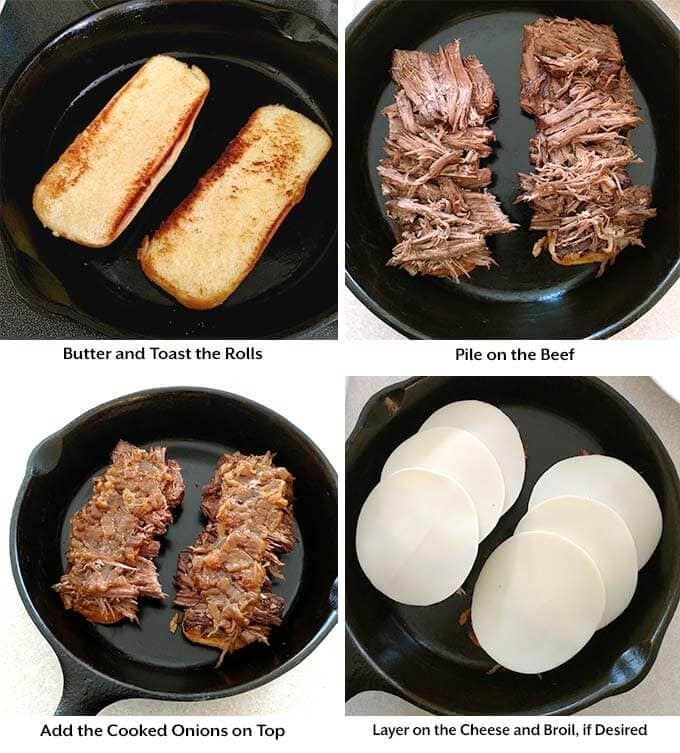 So find a nicely marbled beef roast, grab some hoagie rolls, and make a fabulous batch of Instant Pot French Dip Sandwiches! Lightly salt and pepper the two halves of the roast. Set aside. Turn on the pot's Sauté function. When hot, add the oil. Then add the roast and brown it a few minutes on each side. Remove to a plate and set aside. Add the onion slices and stir (add a splash of the beef broth if too dry). Cook, stirring occasionally, and scraping the bottom of the pot to get the browned bits off (deglaze), until onion start to turn translucent. Add the bay leaf, garlic, and thyme. Stir and sauté for a minute or so (add another splash of the broth if it gets dry). 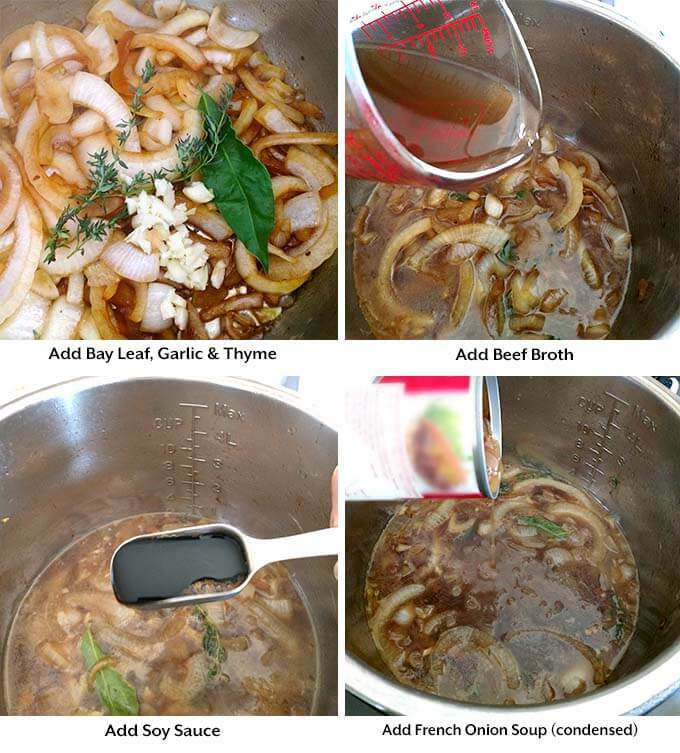 Stir in the beef broth, soy sauce, and French onion soup. Add the roast back in and close the lid. Set the steam release knob to the Sealing position. Cancel the Sauté function and press the Pressure Cook/Manual button or dial. Then use the + or- button or dial to select 70 minutes. When cooking cycle is finished, let the pot sit undisturbed for 15 minutes (15 minute Natural Release). Turn the steam release knob to the Venting position and release the remaining steam/pressure. After opening the lid, check to make sure the roast is tender. If not as tender as you'd like, put the lid back on and set for another 10 minutes. Remove the meat to a cutting board and slice or shred. 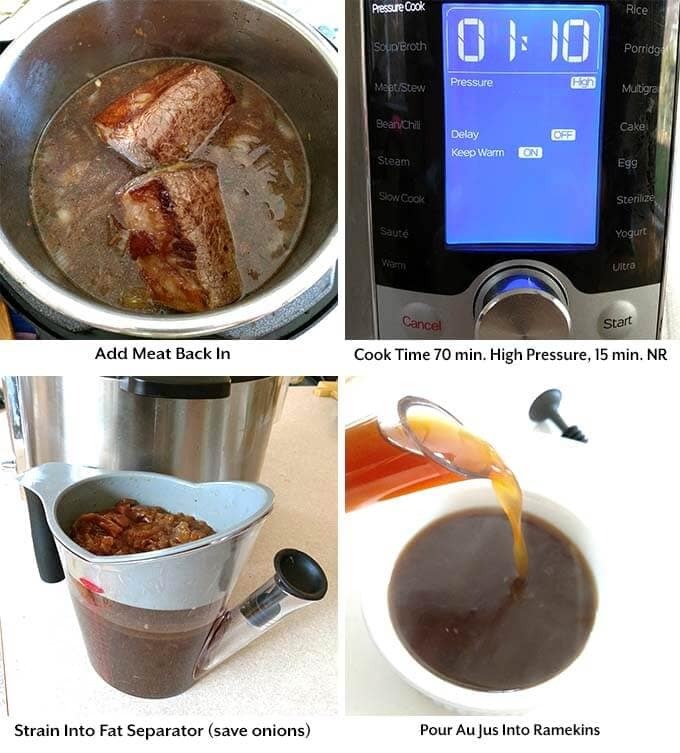 Strain the au jus into a fat separator. Save the onions and pour the defatted au jus into ramekins or small dishes. Spread the butter on the rolls and toast them in a frying pan, toaster oven, or in the oven. 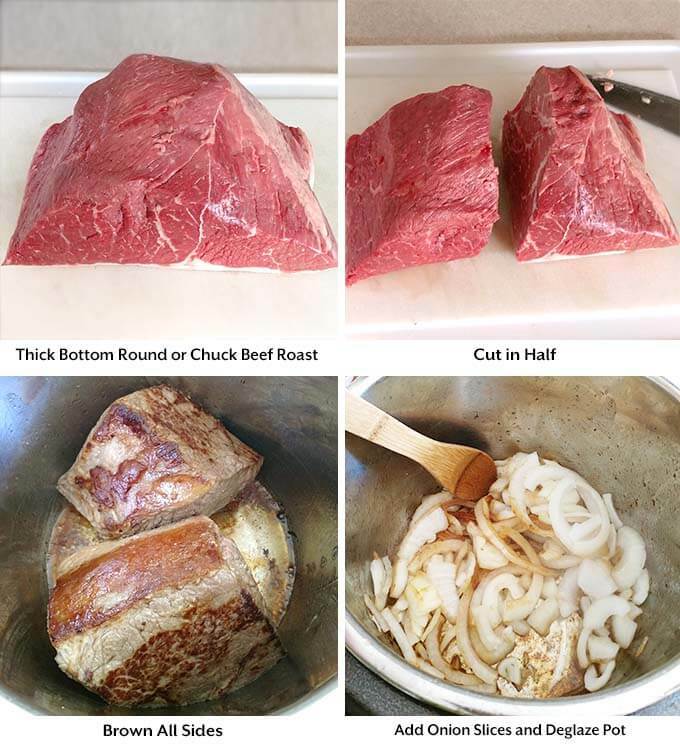 Pile some roast onto a roll, add some of the onion, and then layer 3 on slices of the cheese. Broil to melt, if desired. 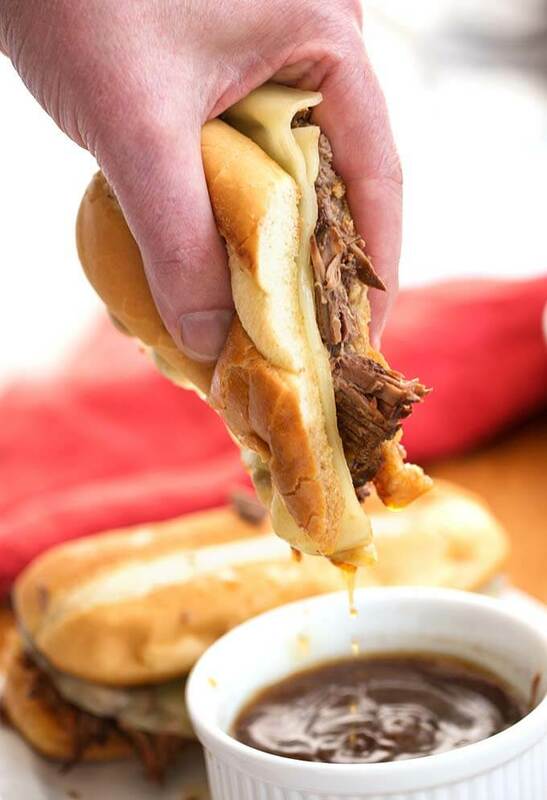 Serve sandwich with a ramekin of au jus for dipping. We loved these sandwiches!!! My kids all ate theirs and kept saying mmmm. It was so easy to make, too. Thank you for such a great recipe for the Instant Pot! Hi Donna, isn’t it nice when the kids like the meal you prepared?! So glad you all liked these sloppy joes. Thank you for your review! What if you do not have a fat separater? Suggestions? Just use a large spoon and skim fat off the top before stirring.